Please join us for a fabulous evening of incredible food, drink and fun as we celebrate spring! 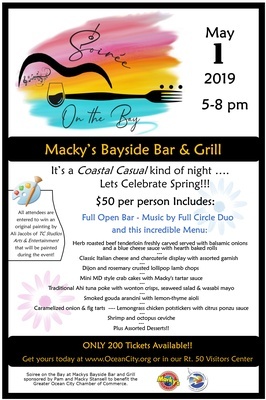 Soiree on the Bay at Mackys Bayside Bar and Grill sponsored by Pam and Macky Stansell to benefit the Greater Ocean City Chamber of Commerce. Tickets to the event are $50 and include a wide array of amazing food, entertainment and open bar!